One of the most beautiful places in the world lies between China and Russia, a place where you can see the blend of both countries set against the backdrop of a culture and landscape all its own. The spectacular nature of this country is dwarfed perhaps only by its remoteness, as one of the least sparsely populated countries in the world. Mongolia is a land of rolling green hills, the magnificent steppe and a nomadic culture that survives to this day. 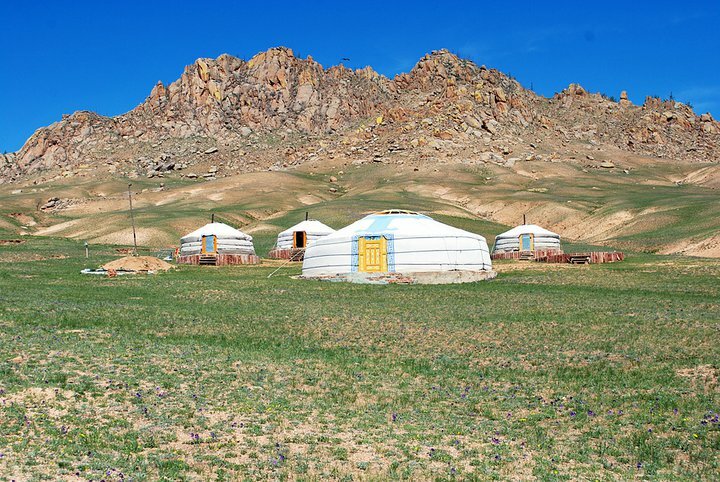 Throughout the country you will see nomadic families set up in yurts, circular houses that are easily collapsed and packed up to be brought on the next leg of the journey. Travelers here will find that they are in a place unlike any other, and are treated to life in the vast, empty wild, an experience that will be with them for years to come. Many travelers choose to tour the famed Gobi Desert on horseback or camel back, riding through this enormous, dry land as native nomads do. This is a wonderful way to experience Mongolia and its natural beauty. If you are on limited time in Mongolia, consider visiting the Terelj National Park, which is only about an hour outside of the capital, Ulaanbaatar. This national park affords you the opportunity to camp in a yurt, hike the beautiful hills and ride semi-wild horses. This last is an adventure in and of itself, as the handlers generally do not speak English and are somewhat amused at rider’s reactions to the wildness of the animals. The yurt accommodations are surprisingly comfortable, with a cozy interior and plenty of blankets to keep you warm when it cools down at night. The host family will prepare all your meals, which aside from breakfast consist of traditional Mongolian nomadic fare. If you’re lucky, they may even slaughter a sheep or goat for you, and serve up the tasty meat for dinner. This is considered an honor in Mongolia, and in some cases, you may be invited to participate in the preparation. Ulaanbaatar is itself an interesting place, though rough around the edges as cities go. There are plenty of places to grab a beer and some food, but hostel owners will caution you against roaming the streets at night, particularly if you are alone. Food and accommodation prices are more expensive here than in other Asian capitals, so be aware of that as well. If you are in the capital, be sure to visit Sukhbaatar Square, and pay homage at the enormous shrine of Ghengis Khan that sits at the front of the square. The conqueror’s presence seems to be everywhere in the capital, with his face plastered on everything from beer mugs to key chains. While some people might favor other Asian cities over Mongolia because there is seemingly more to do and see, do yourself a solid and make time for this gorgeous country. It will provide you with a wholly unique experience and you will be very happy that you came.